Intel i5 series of Processes are placed between i3 and i7, Though Intel may call it mid range CPU, For most day to day function this is a very powerful high end Processor series. Compared to processors two years back, even i3 series is much more powerful, the i5 takes it a notch. The second generation i5 processors based on Sandy Bridge Architecture. They bring some of advanced media features, like better media conversion performance, and a whole new concept of Processor Graphics. With the newer i5, there is on Turbo Boost, which provides increased speed when needed for high processor intensive applications. Media rendering at 3D and 1080p will be much smoother and Intel Wireless Display to 1080p screens are possible. Overall the i5 2410 is better than the i5-480 or i5-540/i5-560 etc. But is it worth the extra money ? The answers are in the details, the newer processor improves the DDR3 support and also improves the overall processor performance even if the raw clock speed is less. So i5-2410M’s 2.30 GHZ is practically 30% faster than the i5-480M’s 2.67 GHZ. Same goes with the i5-560M and i5-580M processors. Overall the Second generation i5 series offers more value and features than anything available in previous generation processors. Based on the cost, which is relatively equal always go for i5-2410M when you have a choice. We are back with the Processor Comparison, this time with the popular mid range i3 series processors Intel Core i3-380M vs Intel Core i3-2310M. i3-2310M is based on the newer Sandy Bridge micro-architecture released first in January 2011 compared to the old Arrandale (based on Nehalem) Micro Architectures. The Major advancements with the new architecture apart from 10-20% CPU performance is a marked improvement in the graphics capabilities of the new Gen processors. From the Integrated Graphics the model changes to Processor Graphics with newer Sandy Bridge Processor. 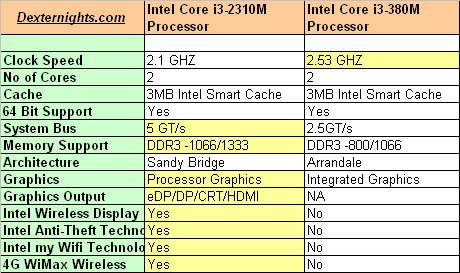 But in terms of Fabrication process both Intel Core i3-380M and Intel Core i3-2310M follow the same 32nm process. The newer chip Intel Core i3-2310M gets some advanced features like Intel Anti-Theft Technology, 4G Wimax technology, Intel myWifi etc. But whether most laptops have the capability to use these features is questionable. In terms of raw clock speed i3-380M has 2.53GHZ vs i3-2310M’s 2.10GHZ, but the new performance improvements should nullify any concerns. Both have same cache memory of 3MB. With native Graphics support, ie Processor Graphics i3-2310M will perform much better without a separate Graphics card. In terms of price i3-380M based laptops and i3-2310M fall in the same category ans if you have the choice between Intel Core i3-380M and Intel Core i3-2310M, always go for the i3-2310M processor.